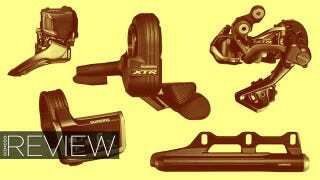 Shimano XTR Di2 Review: Can Electronic Shifters Make Bicycles Faster? Shimano is bringing its electronically-actuated Di2 shifter technology to mountain bikes, claiming increased reliability, faster shift speeds and improved man-machine interface. Can it really make riding a bicycle easier? We spent a day on the trail to find out. What are electronic shifters and how do they work? Let’s rewind for a second. Traditional bicycle shifters use cable-actuated derailleurs to move the chain between gears. There’s the chainring at the front, typically with one to three rings, and the cassette on the rear wheel, with eight or more. Derailleurs guide the position of the chain in relation to these gears. A spring forces the derailleur to one side and cable tension to the other. The other end of that cable is connected to a shifter mounted on the handlebar. So, by using that shifter, you’re either allowing the spring to move the derailleur a bit or pulling against that spring using the cable tension. Cable tension is achieved by mounting that cable inside a rigid housing. To fit a shifter cable correctly, you have to achieve the correct length for both the cable and housing (separate lengths) and then route them along the bicycle frame in such a way that they don’t bend too tightly and don’t become bound as the suspension moves up and down. Downshifts are easy, as the spring tension handles those with just a touch of your thumb on the lever, but upshifts require you to push against that spring for the correct duration of time, allowing the chain adequate time to find its new home. In short, Shimano’s electronic system swaps those cables for wires. So, when you push a shift button, you’re entering a command into a computer rather than performing a mechanical actuation. Electric motors on the derailleurs then relocate the chain. Simple concept, right? Well it gets a lot more complicated as Shimano works to achieve the complete and systematic benefits the technology brings. “Better shifting, better ergonomics, better control,” lists Shimano’s MTB product manager Matt Robertson, of Di2’s benefits. Shimano’s combined its electronic shifting technology with its highest end component group — XTR. So this isn’t just a case of amending electronic shifting to existing components, it’s rethinking their flagship product range to fully benefit from this new technology. In eliminating the need for cable tension, a packaging problem is solved; routing no longer requires finding the gentlest curves or the straightest paths. Wires can simply be taped to brake lines, move inside the frame or follow the complex shapes of chain stays or any other bike part. That helps move the wires out of the way, increasing their ability to survive crashes and hard riding and also eliminates the effect of dirt, mud and other foreign objects making their way inside cable housings. As anyone who has ever performed a tune-up on a bike, or paid for one to be done at a shop or just ridden a crappy old bike will know, traditional friction derailleurs also require perfect alignment to work well. And, since that’s achieved through a balance between a spring and cable tension, it’s subject to change as both components wear and stretch and degrade. Servo-operated derailleurs eliminate the need for that balance and its subsequently high maintenance; they still need to be aligned correctly to work, but achieving that alignment is now easier and should last longer. They should be more crash resistant as well, as the design of Di2’s components moves them inboard, leading to a narrower overall drivetrain. Then there’s the ergonomics. Free of the need to maintain cable tension, the shifters can now go wherever you want them and their function is totally programmable. The re-location benefit probably pays the most dividends on a road bike, where you can position the shifters anywhere in the drops, on top of the bars or both. But even just being able to easily achieve an optimum reach for your thumbs on a mountain bike’s flat bars should pay dividends too. It also gives you the opportunity to clean up the cockpit. Wires can easily be routed inside handlebars and the system can be programmed to provide sequential shifting through both chainring and cassette, from a single shifter. So you can take one of the shifters off the bars. With seatpost and suspension controls migrating up there, one less button is welcome. And, of course, Di2 can control compatible suspension systems too, allowing you to easily toggle between climbing, descending and cross-country settings on the fly from the same control unit. The biggest benefit, however, is simply the speed and accuracy of the shifts. Without having to think about using it, Di2 gives you the fastest possible shifts up or down and nails the chain position with each. The system isn’t subject to the shock of impacts or jostling of rough terrain. If you’re able to hit the button, it will complete the shift perfectly, every time. There’s no slop or waiting for the chain to crawl onto the big chainring, it just moves to its new position with the slick accuracy of a rifle bolt. Shimano claims a real-world “range” of around 186 miles of riding from its battery life; it takes 90 minutes to charge. The system should be weatherproof, but may not survive long-term submersion. “Responsive, accurate shifts at critical moments give you the confidence to react to any transition in pace or terrain,” says Matt. What’s wrong with traditional shifting? As we identified above, cables are difficult to route, the entire system is subject to damage and dirt ingress, and derailleurs can easily go out of alignment, while putting those back in requires an experienced, deft hand. Shifting, particularly to larger chainrings, requires some level of finesse and attention from the rider and can otherwise go wrong, leading to a slipped chain. But Di2 is not so much about addressing failures in mechanical shifting, it’s about finding a new opportunity to increase bicycle performance. “Uphill!” shouted Matt from a couple hundred feet ahead. We were tearing down “The Luge” on Orange County’s Saddleback Mountain in top gear, when suddenly a steep uphill appeared around a blind corner. I had just a couple seconds to get into a low gear or I’d lose all my momentum and fail to make it up. Luckily, a couple of seconds is all it takes for Di2 to make that transition; you just push and hold either shift button until the shifters reach the gear you want, moving chainrings in the process. I made it up and over and didn’t end up looking like an idiot. All this talk of buttons doesn’t do the riding experience justice. If you were to hop on a Di2-equipped bike blindfolded, you wouldn’t know you were riding a bike with electronic shifters. Shimano exerted much effort into tailoring the haptic feedback of the shift levers to replicate a manual system. Yes, you’re effectively just pushing a button, with the benefits of speed, accuracy and ease that brings, but you still push a lever that looks and feels and clicks like a mechanical shifter. You’d simply be surprised by the speed and consistency of the shifts, and then you’d crash, because you’re riding a bicycle in a blindfold. The bike I was riding was a Santa Cruz 5010 C, retrofitted with Di2 shifters. Shimano is making the system in parts, as a groupset and integrating it as a whole into some new mountain bike models. Getting to experience the technology in its most basic form on a nice, but not super high-end XC bike was a good opportunity to evaluate its effectiveness separate from the whizz-bang effect of ultralight wheels and all the other fancy stuff you get with a $4,300 groupset. Here, it was just a shifter, derailleurs, battery and a display. That battery mounts to water bottle cage bosses on any bike frame and is about the size of a big Sharpie. The weight of the system will differ slightly with installation and how much of the XTR set you’re paying for, but shouldn’t be responsible for any real weight penalty in any of its guises. While the battery weighs 58 grams, you’re also saving the weight of cables and housings. The entire XTR Di2 system is said to save 50 grams over a similar 2x11 mechanical setup if you opt for a single shifter, which you should. Allowing that single shifter to sequentially progress up and down gears was, to me, the biggest benefit of the system. With it, just set the desired position of the shifter, then decide whether you want the buttons to be top for up and bottom for down or vice versa. Then, you just progress through the gears as normal, the computer simply manages the chainring shifter to give you a totally sequential progression through the available gear ranges. Because moving up or down on the chainring has a larger effect than simply shifting gears on the cassette will, Di2 will adjust that as well; the net effect to the rider is just a linear progression up and down, you just hit one set of buttons to move through what’s, in the case of 2x11, 14 gears. That’s less mental effort and better management of progress than I could manage using my own brain. With shifts coming so easily, quickly and correctly, you also feel free to shift more often and in more challenging circumstances. Transitions between steep downhills and uphills make seamless a process that was once laborious and you can now shift while tackling rough terrain much more easily. And you’re exhausting far less mental effort even while shifting more, allowing you to focus more on the actual riding with the bike actually working better beneath you. Going into this test as a mountain bike neophyte, I was expecting neat technology that, judging by the price tag of the XTR groupset, wouldn’t be relevant to my limited riding ability. But, I found completely the opposite. Not only was a I able to ride better with electronic shifting — and feel that difference — but it also helped cover my mistakes and and made the overall ride a little bit easier. I never would have been able to nail that transition from steep descent to big ascent with a manual shifter. On my own bike, I would have lost all momentum, slowed down to virtually zero, then toppled over. With Di2, I just slid though the gears and maintained my cadence. It couldn’t have been easier. And any other rider will benefit from Di2 as well. I suggested to Matt that potentially the best application could be for new and casual bicycle riders, who probably find the sheer number of gears intimidating and confusing at a time when they’ve got better things to be concentrating on. His response was sort of a grimace and a suggestion that they’d probably be ruled out by the cost. That’s where Di2 lies right now — it’s a genuine, worthwhile advancement in bicycle technology that is, for now at least, only applicable to racers and rich guys. The rest of us will have to watch and wait for the technology to trickle down to more achievable prices.